Happy Wednesday, friends!! Back again for Day 3 of The Ton’s Anniversary Release countdown. I hope you’ve been enjoying all of the wonderful products being released!! I know we’ve all been enjoying sharing our projects with you. Only one more sleep until you will be able to purchase all of these utterly fabulous products…. such anticipation! If you’re just joining us, The Ton is releasing 17 (yes, SEVENTEEN!) new stamp sets and 2 fantastic dies (an amazing coverplate and a new word die) in celebration of their one year anniversary! Today, we are focusing our attention on Tribal Chic Borders, Like a Boss, Geometric Lattice Cover Plate, Geometric Lattice background stamp, and Fresh Cut Orchids. I’ve already given a sneak peek of the Tribal Chic Borders here, and the Geometric Lattice background stamp here, so here are some projects featuring some of the other goodies being showcased today. My first project focuses on Like a Boss and the Geometric Lattice Cover Plate. The Like a Boss set is chock full of cheeky, crafty sentiments. Now, being a girly girl who loves all things sparkly, the “When in doubt…” sentiment really spoke to me. (I’m sure my husband would agree… all he has to do to distract me is flash something sparkly in front of me, which works far too well when I’m irritated with him!!) The moment I saw that fantastic cover plate, I knew I wanted to die cut it from glitter paper. It’s so beautifully intricate, but still so modern and graphic… just gorgeous. I simply die cut it from some silver DCWV Glitz paper and adhered it to a turquoise card base. My next step was a bit more involved… I die cut each of the flowers from the Petal Cut Peonies die set using regular card stock. I glued the (matte) flowers to a darker shade of the Glitz paper, then fussy cut around the edges. I just love the effect. For the sentiment, I simply heat embossed it on a rectangle of vellum. I adhered the flower first, then I was able to hide my adhesive behind the flowers and sequins. The photos do not do justice to the glitzy, glittery goodness. 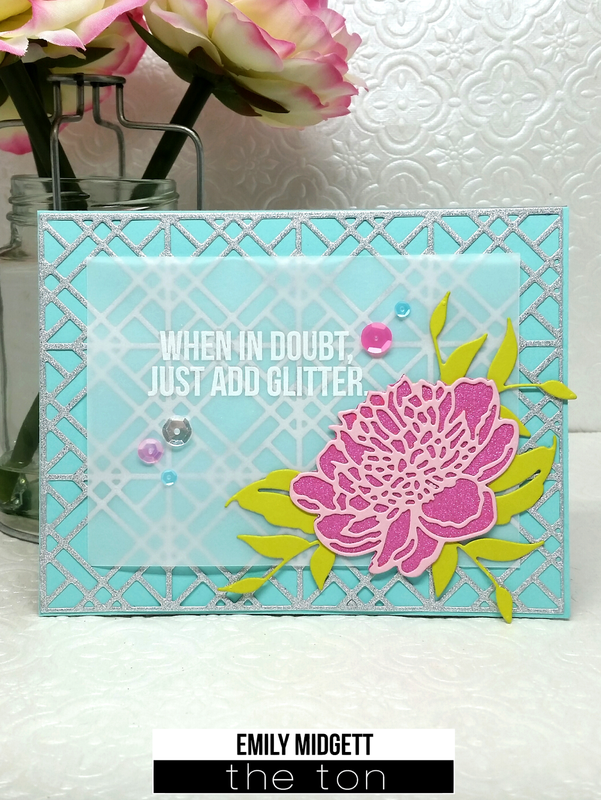 I was so inspired by my glittery lattice die cut that I wanted to use it again on my next card. The orchids in Fresh Cut Orchids are just incredible… The detail is so beautiful, and the ink colors available in the store are the perfect pairing. I die cut the Lattice Cover Plate from some orchid colored fine glitter paper, then adhered it to a navy blue card base. (I just love navy and orchid together… so classy!) I stamped the stem, leaves, and flowers on white card stock, then fussy cut them. The Orchid Couture Color Collection is a perfect match for the Fresh Cut Orchids. I heat embossed the sentiment (from Timeless Icons Sentiments) on a panel of vellum, then arranged my orchids on the panel, popping them up with dimensional adhesive, which I again used to hide the glue when adhering my vellum panel to the card base. A few sequins added some more sparkle to the card front. 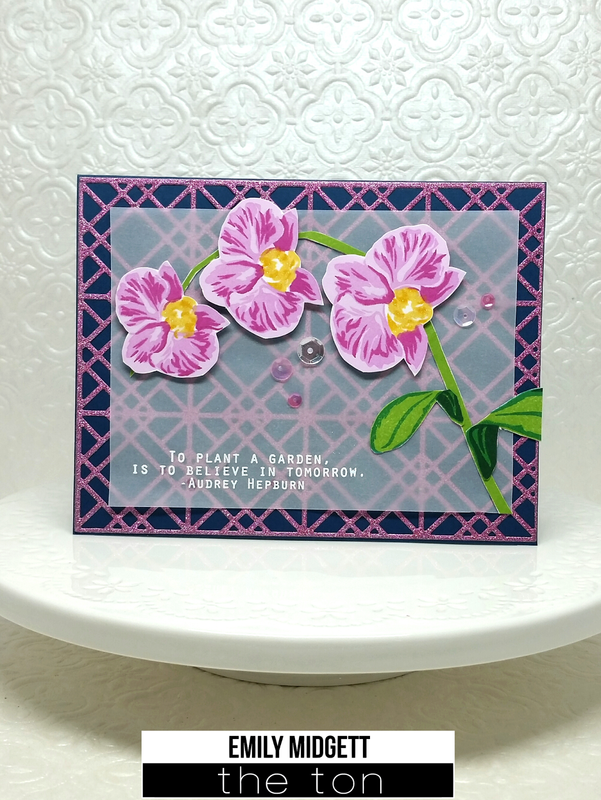 My final card for today is similar in layout to the previous card, but I wanted to showcase how beautifully the new inks blend, as well as how perfectly they work with these Fresh Cut Orchid stamps. I began with a panel of white card stock. Using my round ink blending tool, I covered the entire panel with Orchid Crush ink, then blended Violet Fringe ink around the edge to create a halo effect. I knew I wanted to stamp directly on the blended panel, as opposed to stamping the flowers and fussy cutting them, so after the blended panel was completely dry, I stamped bottom layer of each of the stems, leaves, and flowers using Hampton White pigment ink. I stamped the flowers with 3 layers of the white pigment ink for the bottom layer, allowing a few minutes of drying time in between each stamp. This made the white image truly opaque. I allowed the white images to dry, then stamped the images again with the colored ink. By stamping with the white ink first, I was able to avoid a somewhat “muddy” color that could have occurred from mixing the green ink and the purple ink, as well as allowing the images to really stand out on the colored background. I added the sentiment, also from Fresh Cut Orchids, in Noir Dye ink. A few Glass Slipper sequins added a touch of sparkle to this otherwise completely flat card. I hope you’ve enjoyed the projects today! All of the new products shown today will be available for purchase tomorrow, November 14, at 7am EST. Let us know what is your favorite set released today, and then head over to the other design team members’ blogs… Each DT member has some seriously amazing inspiration for you. Remember to comment on each blog to increase your chances of winning!! Happy Hopping! I love all your card but the last one is absolutely gorgeous! That will be going to someone special! Lucky person. Great job! Last card is beautiful! Love the geometric background die it's so cool too!! OMG!!!!! WOW!!!! So breathtaking beautiful and so beautifully colored!!!! Awesome designs. I love your cards!!!! Beautiful!!!! I love how those lattice glitter backgrounds pop! So pretty! Wow, your cards are amazing! I love the use of the glitter paper! Great use of the lattice plate die with glitter paper along with the vellum! Love the bold look of the design! I drew my breath in when I saw those gorgeous orchids on vellum over that gorgeous background die, but then I scrolled down to the next beauty and was even more in awe!! Fabulous!!! Love all the cards but the ink blending on the last one is fabulous. Your cards are gorgeous! I love how you've used the background cover pieces! Wow!Pretty and elegant too! The cover plate is gorgeous but I am in love with how you made that orchid card. that is stunning! Your cards are truly incredible! Each one is beautifully composed and the elements all go so well with eact other. The new coverplate is fabulous! Beautiful floral cards. I like all the glitter. Just lovely!! Both of them!! My favorite is the second!! Wow! Stunning cards today! Gorgeous colors, fabulis desing on the background and they are just WOW! Beautiful cards especially the first one! Loving the new cover plate! Beautiful cards!! Love what you have done with the cover plate die!! Ooh!!! your first two cards are just stunning with the use of that cover plate die!!! The orchid card is just as stunning with the white outline and the shading you did – love the blending especially! Stunning cards,move your coloring! The Tribal Chic is my fave today! Gorgeous cards! Love the glittered lattice. Beautiful cards my fave today is the geometric lattice background. Amazing examples of that beautiful coverplate in use. Love your cards! Lovely cards! The orchids are amazing! I love the Geometric Lattice stamp and die! Gorgeous cards Emily! 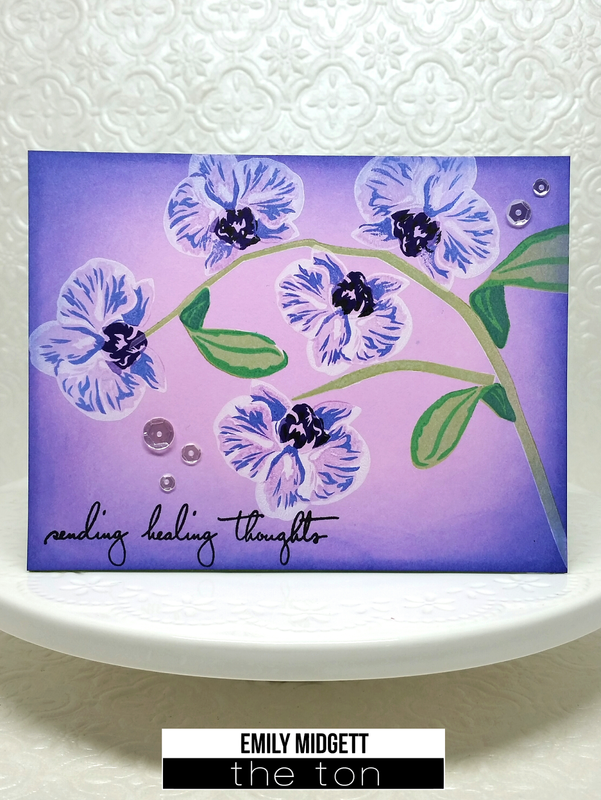 Fabulously vibrant colors and great tip to stamp the white first on the orchid card. Your purple orchards are so beautiful, I just love that card you created, it is very soothing. Beautiful cards. Love the flowers and the colors you choose. Beautiful cards! Love that geometric lace die! Oh My Gosh !! I absolutely love all your cards. Your coloring if fantastic and so stunning. Love the background too. All three of the cards are absolutely gorgeous! Love how you brought everything together in all of them! Thanks for sharing fantastic cards. Love your beautiful flowers.